The greatest responsibility of modern agriculture is to produce food in sufficient quantity and quality to supply the entire world’s population. The use of the latest technology sprayers for treating with crop protection products is a fundamental task to allow farmers to obtain an optimal return on their operation and to harvest healthy food for human consumption. 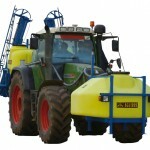 After decades as a major European player in the manufacture of agricultural machinery, we have launched our range of sprayers.